The all-new MacBook Pro is said to have a touch of genius. It is designed with power-packed features and specifications, MacBook Pro is a real beauty to have. If you are a proud MacBook Pro owner and thinking about its protection then we have got some of the best laptop sleeves for MacBook Pro. These MacBook Pro carrying cases and bags are designed to add glam along with protection to your precious device. They are soft to touch and hence prevent your MacBook Pro from unwanted scratches and scrapes. They also let you store some of your small and tiny personal belongings in the compartments provided. Have a look at this list of best MacBook Pro sleeves which I considered when I bought mine. It can help you to select one for you. The top 10 sleeves for MacBook Pro that I have listed here are designed to offer premium protection to the external beauty of your MacBook Pro. Adorned with classy design and craftsmanship, these sleeves are built with the finest materials. Though they are available in a pool of striking colors and designs, they offer a decent protection to your MacBook Pro. Traverse through this list of best MacBook Pro 13 and 15-inch sleeves and grab the best one for you. The MacBook Pro Cover from AmazonBasics is an ideal piece to have. It provides protection to your MacBook Pro from bumps, debris, and other unwanted accidents. It features a top-loaded zipper. Thus, you can easily take out and keep in your MacBook Pro. This cover is spacious enough to store your adapter, charger, or your mouse along with your Pro. One thing to be taken into consideration here is that this cover is designed to fit 15 and 13 inch MacBook Pro. 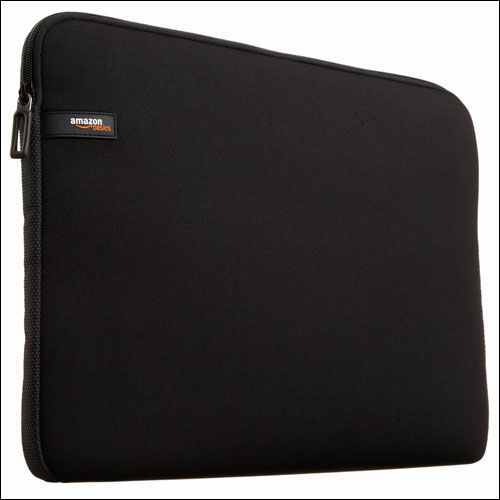 ProCase brings to you the sleeves for your MacBook Pro in different dimensions ranging from 14 inches to 15.6 inches. It is simple in look. Hence, it is a perfect sleeve for office use as it offers a somewhat professional look. It is slim in design and light in weight. You can thus, easily slide it into your briefcase or your laptop bag to carry it with convenience. If you want you can even carry it alone while going to school, college, or office. This sleeve can be opened up to 180 degrees. Thus, you can easily have access to your MacBook Pro. The laptop sleeve for 13 inch MacBook Pro from Tomtoc is well armed with the CornerArmorTM patent in the bottom. The design is such that the sleeve is surrounded by protective ridge so that it protects your Pro from accidental damages. It also possesses a padding bar at the bottom. This adds to the level of protection that it provides to your MacBook Pro. Its wipe-clean synthetic finish enables you to keep the sleeve always clean and tidy. It comes with a large side pocket that lets you store your pen drives, charger, power banks, and other accessories comfortably. Do you own a 15 inch MacBook Pro? If yes, then Lacdo has the MacBook Pro sleeve 15 inch for your glorious device. Available in a pool of soothing colours, you can pick up the one that you like the most. This sleeve is constructed from waterproof canvas fabric. It thus restricts water or vapour from damaging your laptop. Moreover, you can also free yourself from the worries of getting your MacBook Pro damaged due to accidental rain, splash, or coffee spills. Apart from the fabric, the shockproof soft lining is competent to safeguard your Pro from external impacts. The next laptop sleeve for MacBook Pro is from Case Logic. This form-fitting sleeve offers a precise fit to your MacBook Pro or your laptop. It features a seamless wrap of foam padding from top to bottom so as to protect your MacBook Pro from any kind of damages or impacts. The design depicts woven webbing along all the sides. This slim sleeve offers you the options that fit into your comfort zone. That is, you can slide this sleeve along with your MacBook Pro into your bag or can even carry it alone. Adorn your gorgeous device with the MacBook Pro touch bar sleeve from Runetz and flaunt your style. It is specifically designed to fit your 13 inches MacBook Pro. You can even other laptops with the display size of up to 13.3 inches. This zippered sleeve features padding in the interior so that your laptop remains protected in case of unexpected damages. It is constructed of top grade materials so as to ensure premium quality and durability to the user. Furthermore, these sleeves are available in different colours with contrast zipper colours. The MacBook Pro bag from Inateck features a top-zippered design. The convenient opening of the zipper offers you to easily access your MacBook Pro at any time. It is slim in design and light in weight. Hence, it won’t add any bulk to your MacBook Pro. The front layer of the sleeve is made of splash proof canvas and the middle layer is of diving material. Thus, your MacBook Pro stays safe from water spills or rain. Moreover, the foam padding layer absorbs external shocks, bumps, and hence protects your MacBook from scratching. MoKo has the best leather MacBook Pro sleeves for you. The exterior of this sleeve is made from top quality of PU leather and the interior is made up of soft PC material. Thus, it remains soft against your MacBook Pro and prevents it from unwanted scratches. This leather sleeve comes with a built-in card slot. You can thus, store your important business cards, debit/credit cards, USB sticks, mobile hard drives, keys, and your tiny belongings. It is specifically designed for your 15 inch MacBook Pro. 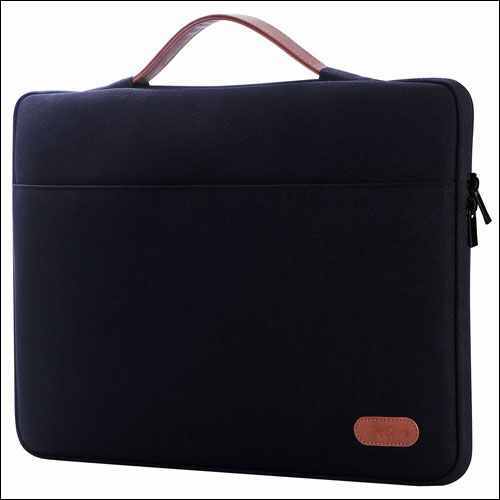 ZinMark laptop carrying case for MacBook Pro is made from extra durable and wipe-clean synthetic material. This finished material makes your sleeve look more presentable and always in fantabulous condition. It is slim in design and light in weight. Thus, it won’t add any bulk to your MacBook Pro 13 inch. You can even easily slide it into your backpack or briefcase. This sleeve is adorned with a side pocket which provides you with the space to store your power adapters, cables, pens, or notepads. If you are a fashionista and love to keep up the latest trends in your gadgets, then this sleeve from Incase Designs id the perfect one to buy. The zippered closure offers protection to your MacBook Pro and also the convenience to easily access your device whenever you wish. It is constructed from durable Neoprene material. Hence, you can use it for a long time without any fear of wearing it out. The Thule Gauntlet 3.0 sleeve is an amazingly sturdy sleeve-case for your MacBook Pro. It comes in a wide variety of 4 colours – dark shadow, potion/Aruba, storm/lichen, and of course, black. Besides a 13 inch MacBook Pro-Thunderbolt 3 or a 13 inch MacBook Pro with retina display, it can easily fit devices of 12.4*.7*8.6 Inches. Due to enhanced corners and a rigid exterior, this sleeve provides added protection to the body as well as the edged corners of your device. The padded interior, on the other side, completely protects the hardware from any bumps or scratches. The clamshell design allows you to use MacBook Pro inside the case – a perfect way to protect your device from outside elements like dirt and dust. This is a traditional hand-crafted genuine leather sleeve-case for your MacBook Pro. It creates a classic, stylish and sophisticated look when you carry your MacBook Pro in it. It is designed perfectly for 15” MacBook Pro 2016, with newer Touchbar or no Touchbar USBC-3/Thunderbolt 3 devices. This vintage Twelve South BookBook is made of two hardback book covers along with a rigid spin that protects your MacBook with impact absorption Plush. As it is tucked inside BookBook, the MacBook will be camouflaged as a vintage book. The velvety interior all the more keeps the MacBook looking almost new while inside. Moreover, it has a hidden inner pocket allowing storage for papers or documents. This makes your essential documents handy for any meeting or during any commutation. Do note, over-stuffing is strictly prohibited. You can carry at the most 20 pages, depending on the thickness of the paper. You can also carry swatches, color chips or fabric samples of the same thickness inside it. These are some of the best MacBook Pro sleeves on my list. Which among them would you like to buy? Do share your views and choices with me in the comments section.